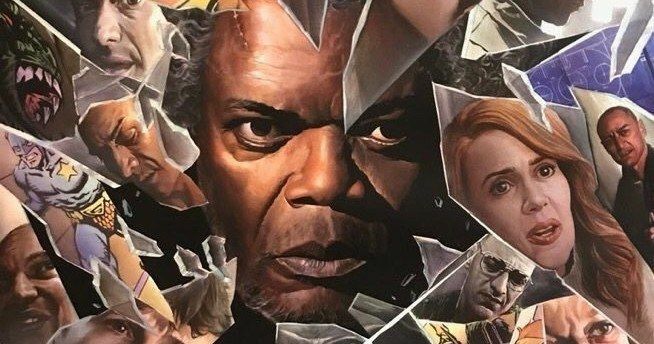 A brand new poster for Glass is here, straight from San Diego Comic-Con. This is a big day for the sequel to Unbreakable and Split, as the first trailer for the movie also debuted during Universal's panel at the event, which may have been the most highly anticipated footage coming our way this weekend. And that's saying something. To go along with the first trailer, the studio brought this amazing, exclusive poster to SDCC, which can only serve to get moviegoers even more excited about what is coming our way next year. The poster is being handed out to some lucky attendees at SDCC 2018. Specifically, during the Glass section of the panel to those who asked director M. Night Shyamalan a question. The poster has a distinctive style, aside from being rather stunning, and that's because it was designed by legendary comic book artist Alex Ross. Even though Glass isn't specifically about any fictional comic book characters that exist in our world, it does play on the mythical idea of superheroes quite creatively. So having a guy like Ross design the poster is a nice tip of the hat to the overall concept and what was shown off in the Glass Comic-Con trailer. Much like the posters for both Unbreakable and Split, this poster plays with the idea of shattered and broken glass. This time, though, it's absolutely destroyed. Interlaced with all of the characters set to appear in the movie are actual comic book characters. As the trailer reveals, this movie is going to deal with the idea that an increasing number of individuals in the real world fancy themselves as superheroes. The poster fits right in line with that concept. There is absolutely nothing wrong with the previously released theatrical poster, but this is pretty tough to compete with. From Unbreakable, Bruce Willis returns as David Dunn, alongside Samuel L. Jackson as Elijah Price, known also by his pseudonym Mr. Glass. Joining them from 2017's Split are James McAvoy, reprising his role as Kevin Wendell Crumb and his other various multiple identities, and Anya Taylor-Joy as Casey Cooke. Unbreakable's Spencer Treat Clark and Charlayne Woodard are also on board, who reprise their roles as Dunn's son and Price's mother. Last, but certainly not least is American Horror Story and Ocean's 8 star Sarah Paulson, who plays a psychiatrist specifically trained to handle individuals who believe they have superpowers. M. Night Shyamalan made a serious comeback last year with Split which, in addition to being a top secret sequel to Unbreakable, was a massive critical and commercial success. That's something Shyamalan hadn't had in a long time after a string of disastrous movies had him sitting quietly in director's jail to think about what he'd done. Let's hope that Glass follows suit and delivers the goods. Universal Pictures and Blumhouse are set to release Glass in theaters on January 18, 2019. Be sure to check out the brand new poster from Alex Ross for yourself below.